Joanne peh and 715 are married already???? Wow that was fast but congrats to them both!! Wait I always think that Joanne Peh is still with Bobby Tonelli and then suddenly she is married to Qi Yu Wu already? So is qi yuwu and joanne peh marriage real? Slightly disappointed that Joanne Peh can no longer be seen as an spg. Qi Yi Wu marry Bai Wei Xiu, then Joanne Peh will also be known as Mrs. Qi-Bai WeiXiu . @dyzpa Joanne Peh is officially the most committed beard ever. Is Joanne Peh secretly a guy? 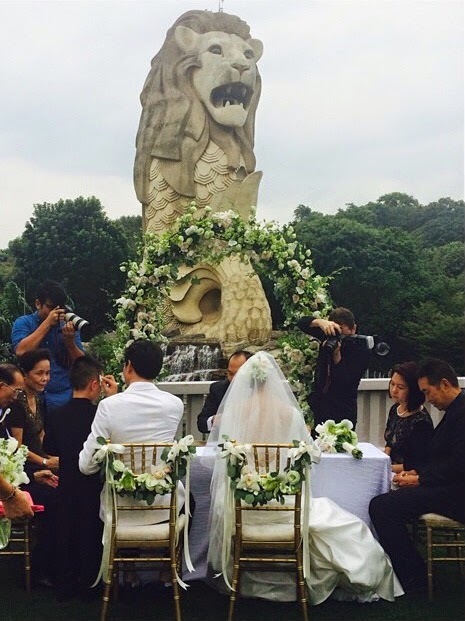 "No other local artist attended Joanne Peh & Qi Yuwu's wedding, except one." The first person I thought of was Xie Shao Guang. LOL. EARLIER: Joanne Peh & Qi Yuwu: Is she really going out with him? COLUMN: Goodbye, Boanne: Did Joanne Peh marry Qi Yuwu just to spite me?